Tomorrow (Wednesday the 31st of August) there’ll be an update over at ECY. 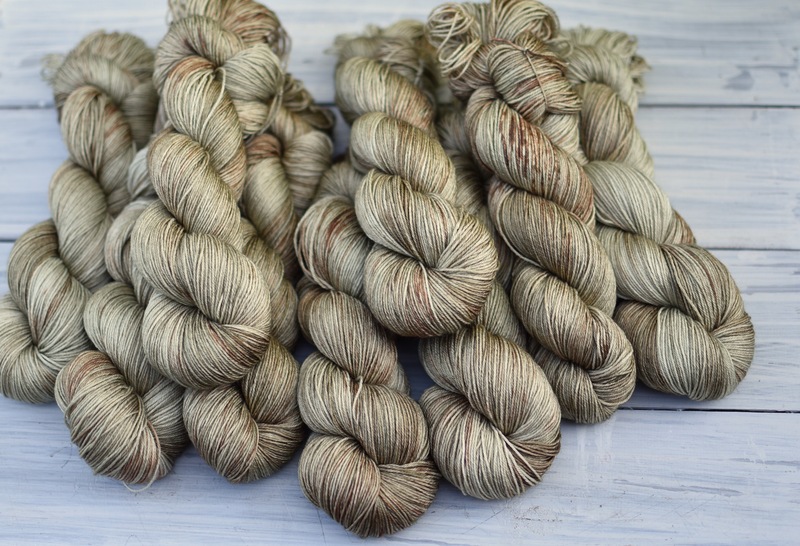 It includes more than 400 skeins of Titus 4ply- that’s our superwash merino/silk. I’m sure I don’t need to mention how lush it is but just in case – it’s smooth, soft, drapey, and I find it amazingly hard wearing too. 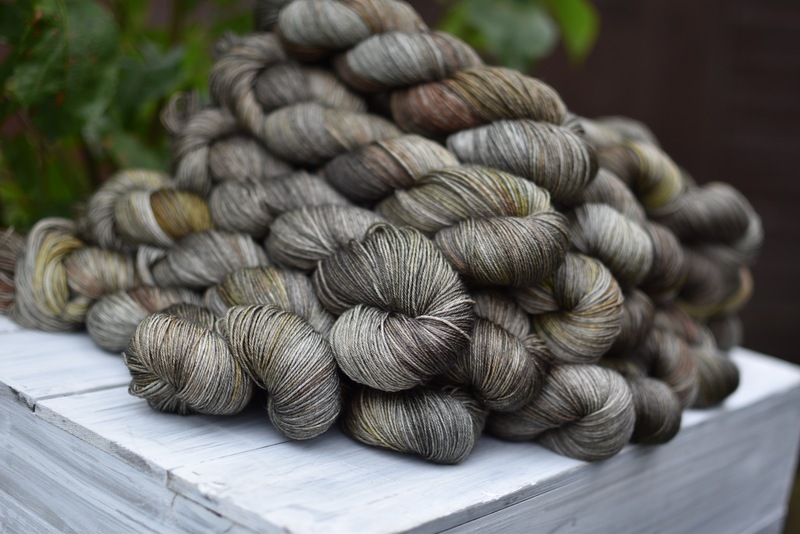 Anyhow, I have piled up one skein of every colour so that you can see at a glance what will be in the update. 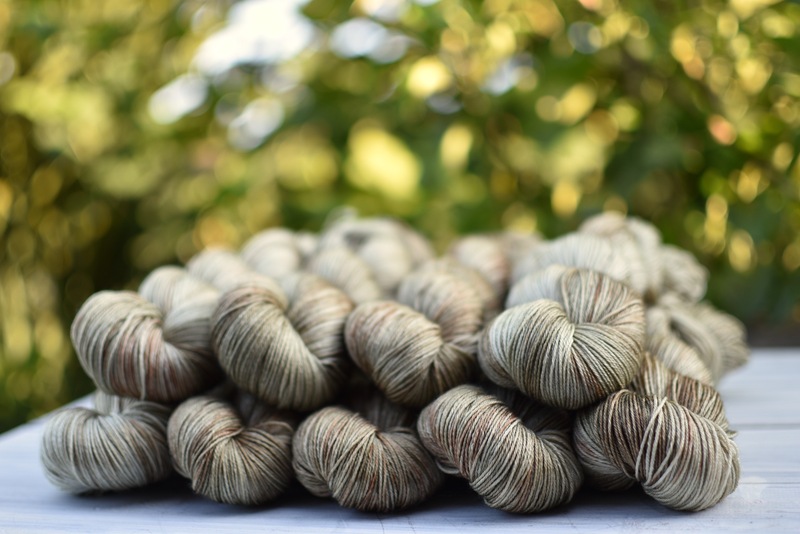 Before I carry on actually – the Titus 4ply page which is where you’ll need to be is HERE. 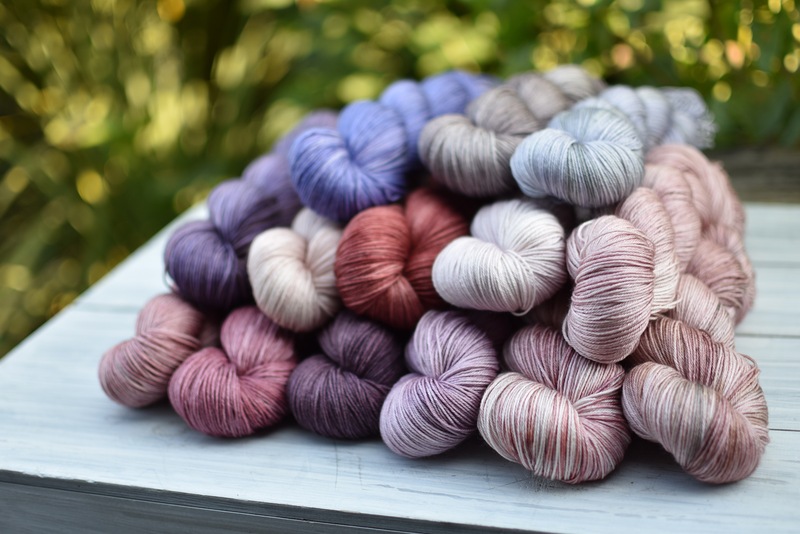 It’s fair to say that updates sell out very quickly, so if there’s something you miss out on please don’t stress – I’m always here and I’m always dyeing more. It may take a while but there will always be more yarn! One more thing – these photos were taken in the morning, in the shade. There’s a slightly blue daylight cast on them, to my eyes. The colours may look warmer if you look at them in say, cloudy daylight or bright sunshine. 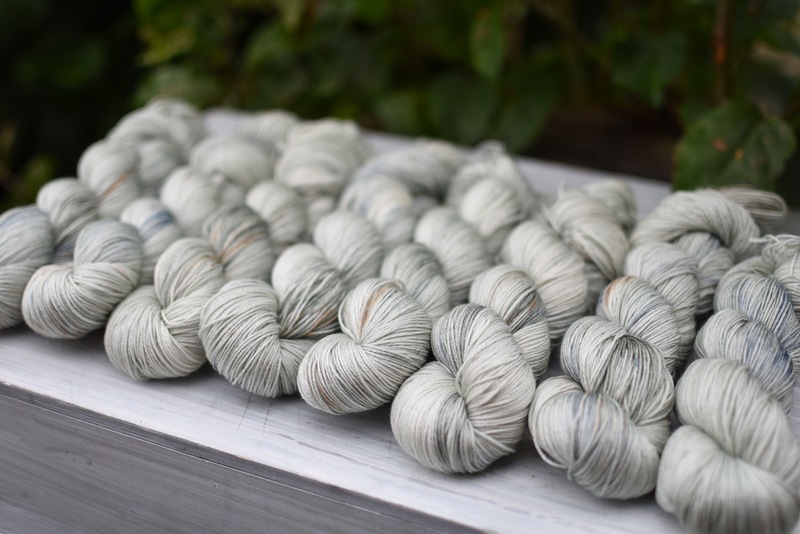 I don’t like to edit the colouring in my photos as I prefer to show the yarns as they look outdoors in natural light. It’s one of the reasons I like to take photos of lots of colours together, so that you can see how they interact with each other. If all else fails, I can take returns. Ok, without further ado, here are the (mostly) greens and sort-of-golds. 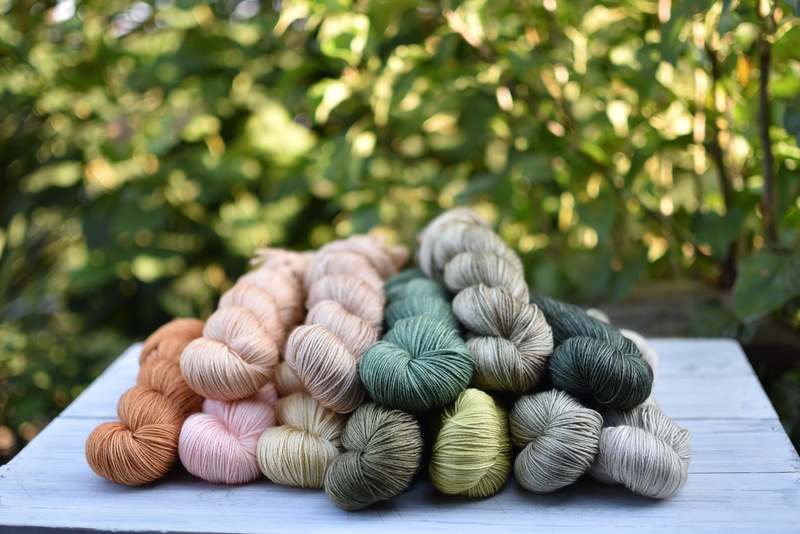 Top row (L-R): Oatfields, Falling Leaves, Larch, Forest Path, Cedar. 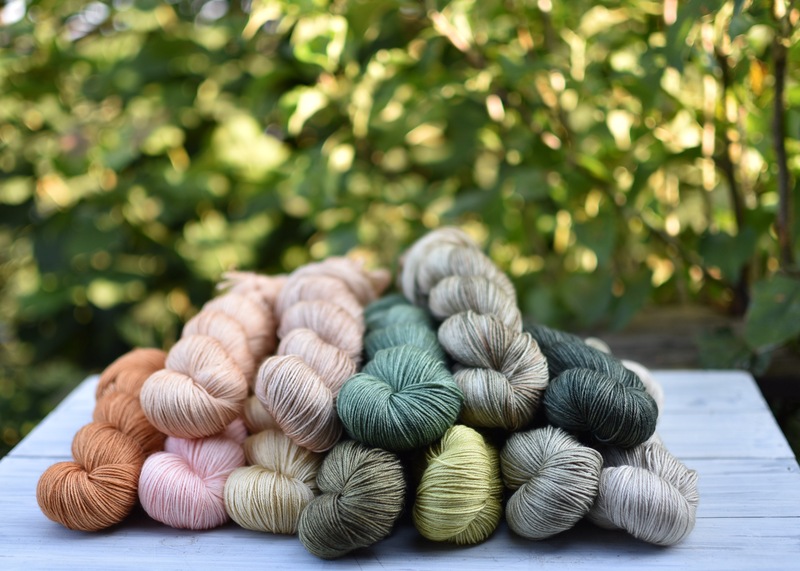 Bottom row (L-R): Copper Bucket, Apricot Tulip, Summer Harvest, Woodland, Fern, Coppice, Fen. 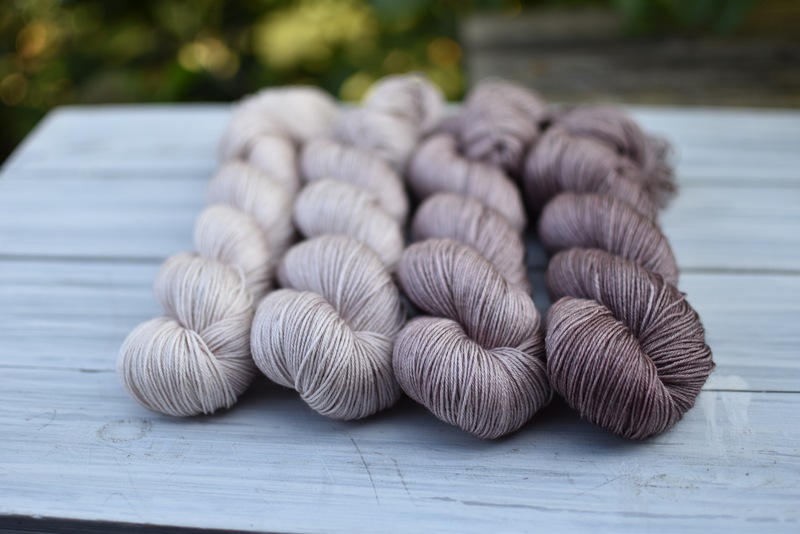 Middle (L-R): Moorland, Stonecrop, Red Kite, Antique Rose, Rambling Rose. 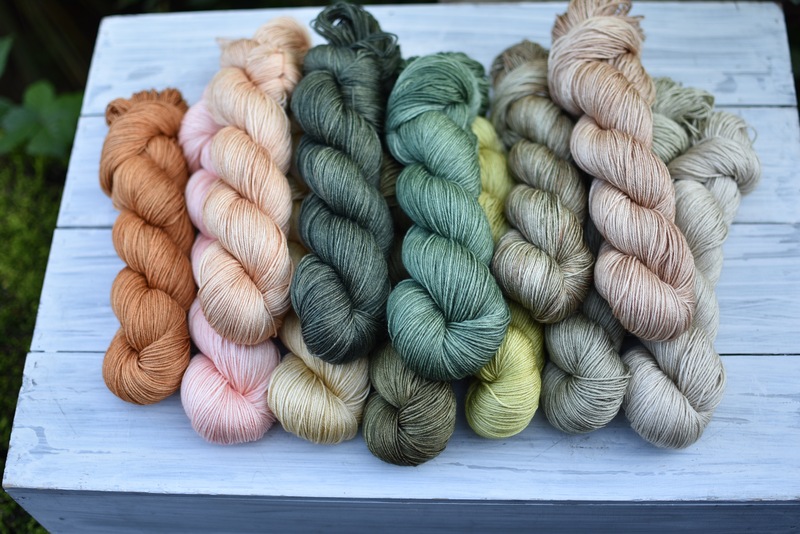 Bottom row (L-R): Briar Rose, Faded Bloom, Black Magic Rose, Wild Raspberry, Wild Flowers OOAK, Rose Bed. What is it with all the roses? They’re just good, that’s all. Before I move to the blues, I thought it might be helpful to see some neutrals together, as they’re very similar. So below (L-R) are Driftwood, Stone, Bark and Compost. Driftwood is a bright beige compared to Stone’s more oatmeal sort of hue. 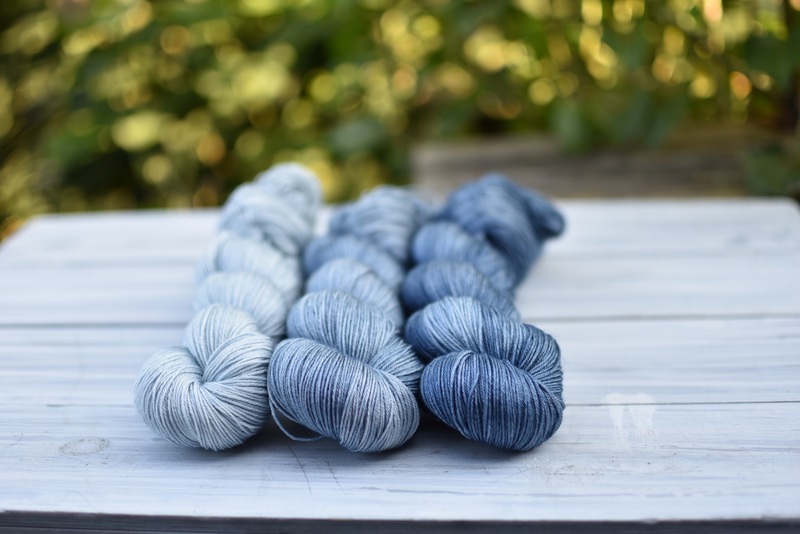 And here are three favourite blues together, which I also thought might help. These are (L-R) Campanula (formerly Ice; I thought it deserved a better name after serving me so well for the past five years); Millpond, and Tarn. There are loads of other blues – I’ll maybe cover them as a palette another time. So here are the blues and coffee-ish shades together. Top row (L-R): Driftwood, Stone, Bark, Campanula, Compost. Bottom row (L-R): Harbour, Robin Egg (which looks really silvery in its website photo), Tide, Cromer Pier, Steel, Millpond, Tarn. So that’s all the individual yarn.. 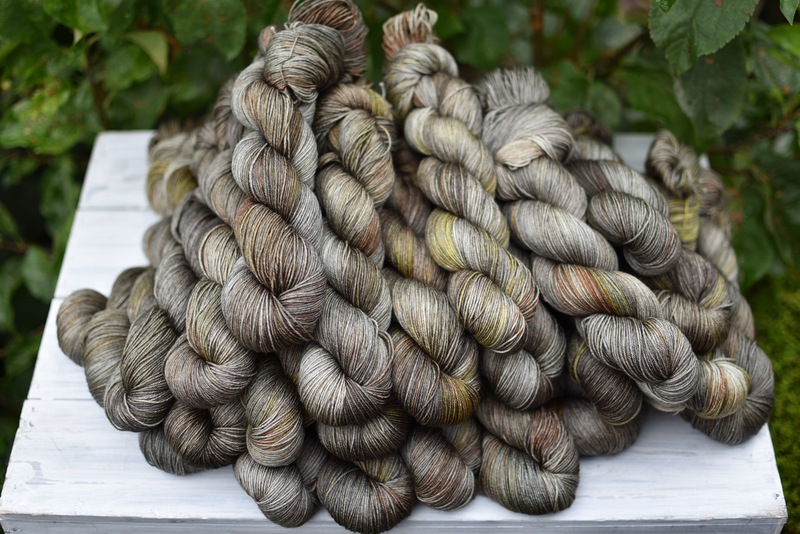 I also wanted to show you preview pics of the variegated-ish dyelots that I’ve done. This is Rose Bed. It has a base of Rambling Rose, but also has mostly-subtle soft gold, pinks and greys washed through. 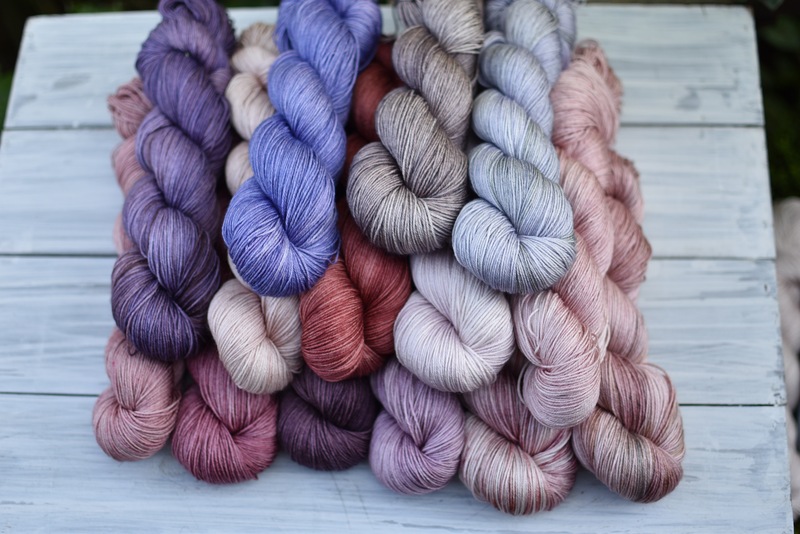 Next up we have Starling.. there are 25 skeins here which will all be available. It’s a slightly lighter batch than the previous one, and quite varied despite being all one dyelot but if you buy more than one I will do my best to match them. And here’s Cromer Pier; all 30 skeins of it. 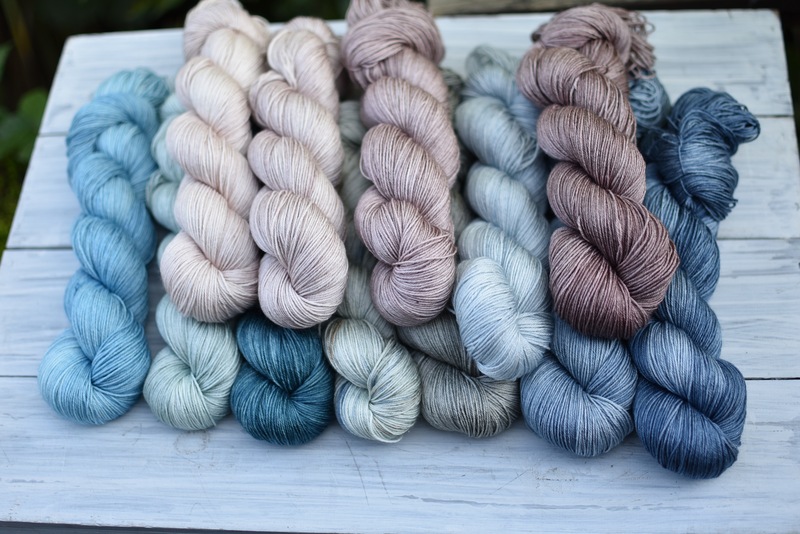 Again, these are all different despite being the same dyelot so I will do my best to match skeins if you’re having more than one. I think they are more colourful in real life, but they always look more subtle on camera. 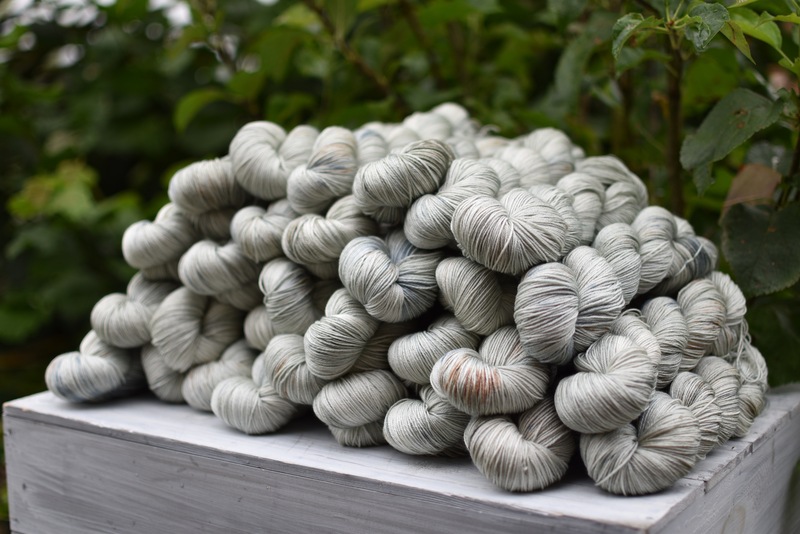 There’s one more batch of just five skeins – it was a total experiment, it’s called Wild Flowers OOAK (although I feel I may make more – but it might look different next time), and I don’t yet have a photo of it so you’ll have to wait for it as a surprise! So.. don’t forget.. Wednesday the 31st at 7pm is the time and THIS is the place. Ooh so pretty!!! Love them all! Hey! Is there going to be an update or not? Yes – it was 8 minutes ago. Next Post ALL the colours!